Let me preface this with two (large) caveats. First, I have never really played any Bethesda games, and have a total of ~5 hours experience between the Elder Scrolls and Fallout franchises. Second, and related, I have not followed TESO at all. I mean, as much as is possible, at least – I knew a few things about it, and I knew that a lot of people had strong negative reactions to it. So, then, it was a bit odd that I found myself picking up a copy of the game yesterday and playing it for about 4-5 hours last night. There are a few reasons that I ended up doing this, but the primary driving factor is that I may end up talking to some people involved with the game, and I didn’t want my complete and utter ignorance to show through. This clearly called for some background research, and, well, I’ve spent $60 on a terrible game lots of times before. If nothing else, I figured it would make for an interesting blog post and some ability to commiserate with certain factions of the internet. That said, it wasn’t all bad going in. I had heard some talk about the relatively flexible class system, and that seemed like something that I was pretty interested in trying. I knew that it had some version of active combat, and I’ve enjoyed that quite a bit in TERA and WildStar’s beta. It’s heavily voice-acted, which I loved in SWTOR. And, also like SWTOR, it happens to use HeroEngine – which is a platform that was originally built by Simutronics, with whom I have a long and storied past. First things first, the character creator is something that I could spend a ton of time with. Aside from the fact that the races consist of Humans, Human-looking Elves, Human-looking Orcs, some other Humans, and mostly-Human-looking Cat and Lizardfolk, I was pretty happy with the variety of options available. There are tons and tons of slider bars, to tweak everything from Eye Color, to Ear Tilt, to Neck Thickness, to “Posterior Size”. There are plenty of variations on hair, accessories, tattoos, and body makeup. 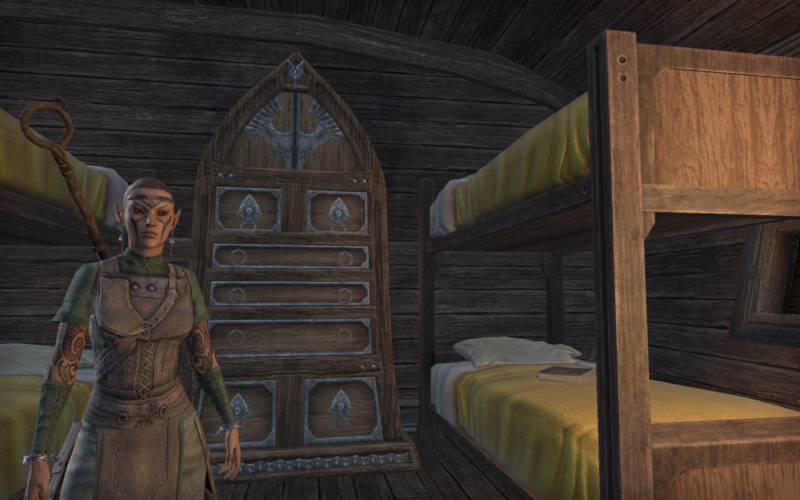 In the end, I settled on a Wood Elf. I ended up picking Sorcerer for my class, and started off using a staff (because that’s what happened to be on a bench in the starting area). But the cool thing is that, it seems like all of the classes can use all of the weapons, and you actually derive your skills from a combination of things. Which is good, because I eventually decided that I wanted to try out being an arcane warrior and run around with a 2-handed sword for a while. And then I moved on to archery. I read about some people running around with two axes and magic. That seems awesome. Essentially, you level up in various skills separately from each other, and can mix and match skills from your Race, Class, Weapon, Guild, etc. Every so often, you get to put a point in to one of the skills, and it feels like you can really just customize them to play in tons of different ways. I have no idea if this game will end up having a ton of viable ways to play your character, but I sure hope so! Of note: it definitely does seem like you can “waste” points early on, if you aren’t really sure what you want to do. I’ve already done it with a couple points in staves that I may not ever use again. But I also don’t care. Points come quickly enough right now, and I get the feeling that there will eventually be more than enough to go around. And just running around doing stuff is pretty fun. I know there has been some talk about it not being open-world enough for fans of the series, and I totally get that. But that is also one of the things that has put me off of the series, in the past. Not having any real sense of direction can get super awkward for me, especially when that is the very first introduction to the game. Here, I feel like I do have some amount of guided tourism, but there are also people/events to interact with along the way. It’s a good mix that is working for me. Hey, look, the Queen says I am the One True Hero! What are *you*? Some of the voice acting and writing is less than stellar, it’s true. But I’m somehow okay with that. I think the very fact that there IS voice acting is still novel enough to me that it is a net positive. And people are having issues with the fact that ESO does not necessarily look as brilliant as fully-modded Skyrim. Which is true, because you can totally do stuff like this. But, honestly, I like the way it looks. I think it looks quite a bit better than many other MMOs that I am/have played, and there are clearly concessions that have to be made because of the number of people playing it at once. I honestly think that the biggest disconnect may just be that I’m approaching this from a non-enfranchised MMO player’s perspective, rather than a long-time ES universe devotee. I’m sure that, if I’d spent hundreds of hours with these games in the past, I would be able to find a lot of things that they did wrong – or at least, differently – that annoyed me. I even expected to find that when I didn’t have that background. But, instead, I’m finding a world that I am enjoying playing in. And maybe this will serve as an eventual gateway into the rest of the ES universe! Who knows? 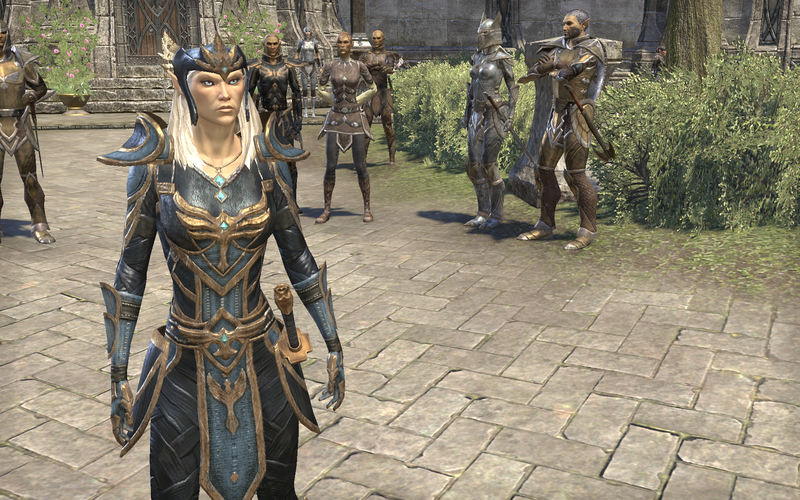 All I do know is that I am pleasantly surprised and fully intend to keep up with TESO. At least for a while. I didn’t know about the Simutronics info you mentioned. The first online game for me was Gemstone. Absolutely fell in love with it and played for years. The lag is not commonplace, at least for me. Happens on occasion. Hopefully that will smooth out. A big issue for me is botting. In all the public dungeons at the boss there is always a stack of bots. It is hard to get a shot on the boss to get credit for completion even. This has been my biggest concern with the game so far.